Return to the Banished Cells and free its keepers from Daedric servitude. The Ancient Keepers, sworn to imprison the spirit of High Kinlord Rilis, have taken to forming Daedric pacts. Keeper Cirion has asked for help in defeating the corrupting force of Rilis, but will require fighting the Keepers directly. Defeat Keeper Areldur and smash the first binding stone. Defeat Maw of the Infernal. Defeat Keeper Voranil and smash the second binding stone. Defeat Keeper Imiril and smash the third stone. Speak to Cirion and smash the final stone. Defeat High Kinlord Rilis and find Cirion's body for your reward. This quest picks up after the events of Banishing the Banished from the non-Veteran Banished Cells. When you enter the dungeon, you'll find Keeper Cirion being mocked by the voice of High Kinlord Rilis. Speak to him and he will explain that the other keepers turned to forming Daedric pacts in order to prevent Rilis from ever escaping again. 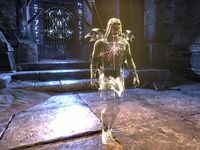 However, in return for their new power they have become servants of Rilis, and the imprisoned kinlord plans to escape the Cells and plague Tamriel. Cirion refused to take part, and remains the only keeper free from Daedric influence. Agree to help, and Cirion will task you with destroying the binding stones while he goes to confront Rilis. By doing so, Rilis will be allowed to return to Nirn, where he can finally be killed. However, the stones are guarded by the three keepers, as well as undead and Daedric guardians. The first binding stone is guarded by Keeper Areldur, who offers a relatively straightforward boss fight aside from his unique fire attacks. Once Areldur is defeated, destroy the binding stone and continue to the next boss, a colossal daedroth called Maw of the Infernal. It has the ability to create fire obstacles every time it strikes. 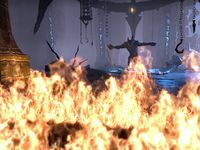 Combined with its high health, this ability can quickly fill the room with fire if this boss isn't kited carefully. The second stone is guarded by Keeper Voranil, a standard melee boss. The third stone is guarded by Keeper Imiril, who is significantly more powerful than the other two keepers. Aside from her large AoE attack, Imiril summons blue AoE orbs into which she will periodically vanish. The orbs also summon large groups of banekin, winged twilights and clannfear. After destroying the third binding stone, you will have to face Sister Sihna and Sister Vera, a pair of harvesters. They attack like regular harvesters, but your group's damage dealers should still focus on taking one out quickly and destroying their healing orbs. Once you reach the final room, you'll find Keeper Cirion surrounded by attacking Daedra. Help him out, then speak to him and smash the final binding stone to begin the boss fight. The final boss is, of course, High Kinlord Rilis, who has transformed himself into a Dremora. He can summon powerful blue flame AoEs and daedroth mobs, and has the ability to lift group members into the air and deal fall damage. He teleports around the room often, and can inflict two different debuffs which can only be removed by retreating the either the blue or the red summoning circles on either side of the room. The slowing red debuff can prove fatal if you're caught in a fire AoE chain, so prioritize using the red summoning circle. 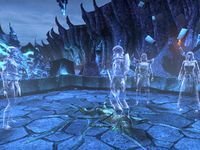 If your group is attempting to earn a Gold Key for the Veteran Banished Cells Pledge, you need to leave three daedroths alive at the end of the fight, although the challenge of tanking or healing against that many mobs will naturally prove challenging. Once Rilis has been defeated, any surviving daedroths will disappear. Cirion's body can be found on the raised platform, having sacrificed himself to banish Rilis to Oblivion. Approach the body for your reward. If you stick around at the end, a small scene will play out between the ghosts of the four keepers, now released from their eternal service. Keeper Cirion has sent me to undo the binding stones that prevent High Kinlord Rilis from materializing in this plane. However, Rilis has corrupted the other Keepers, who will no doubt stand in my way. The first stone is somewhere up ahead. Keeper Cirion has sent me to undo the binding stones to bring High Kinlord Rilis into this plane of existence where he can be killed. However, Rilis has corrupted the other Keepers, who will no doubt stand in my way. The second stone is up ahead. Keeper Cirion has sent me to undo the binding stones that prevent High Kinlord Rilis from materializing in this plane. However, Rilis has corrupted the other Keepers, who will no doubt stand in my way. The third stone is up ahead. Keeper Cirion has sent me to undo the binding stones that prevent High Kinlord Rilis from materializing in this plane. I've undone three of the four stones, and should speak to Keeper Cirion. Keeper Cirion intends to trap the spirit of Rilis with his body, binding the High Kinlord to the mortal plane. Once done, Rilis can be killed once and for all. I need only to use the last binding stone. Cirion has inserted himself as Rilis' host, binding Rilis to his mortal body. If Rilis is defeated, the High Kinlord will at last truly die. Finishes quest High Kinlord Rilis has been defeated. I should check Keeper Cirion for signs of life. This page was last modified on 3 December 2018, at 08:16.